The meta title of your page has a length of 67 characters. Most search engines will truncate meta titles to 70 characters. 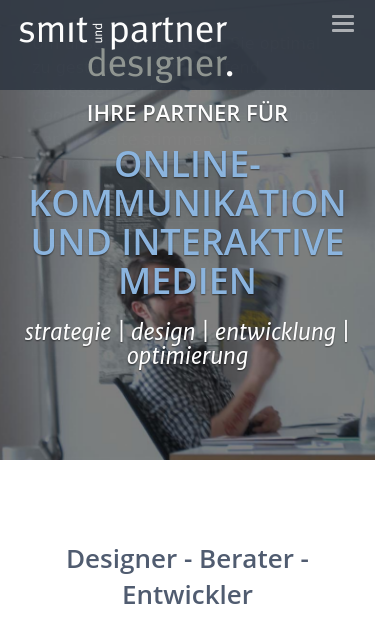 Ihre Partner für interaktive Medien und Interfaces. Wir kümmern uns um den Content, die Usabiliy und die Gestaltung ihrer Website und Online-Anwendungen. Your webpage doesn't use any HTML compression! You should compress your HTML to reduce your page size and page loading times - this will help your site retain visitors and increase page views. If you were using compression, you could be compressing your HTML size by 74% - from 36.23 Kb to 9.26 Kb . Your website loading time is around 3.22 seconds and this is under the average loading speed which is 5 seconds. https://smit-und-partner.de and https://www.smit-und-partner.de resolve to the same URL.